Are you wondering where to shop for clothes, gourmet food and wine, or gifts on Sundays in Paris? It can admittedly be a little tricky. Due to both state regulations and cultural norms, most stores and shops in the French capital stay closed on Sundays. This regulation, while rooted in religious traditions, is now mostly still in force due to a still-strongly held cultural belief that retail employees should not be made to work on Sundays. However, particularly in areas with lots of tourist traffic, a growing number of stores, shops and shopping centers in Paris have been opening their doors on Sundays, often for limited hours. Read related feature: What to do on Sundays in Paris? So if you're set on getting out there for a shopping spree at the end of the week, read on.This list is neither exhaustive nor definitive, but if you're looking for a place to shop in Paris on the quietest day of the week, it's a good place to start. Read on for our full tips on where to head, and what to buy. The Carrousel du Louvre is a shopping mall beloved by Parisian locals and visitors alike, and situated above the exhibition spaces at the celebrated museum. Open 7 days a week, the Carrousel du Louvre features dozens of shops, a gourmet food court with 14 restaurants, and an elegant and airy setting. The bottom part of the famous glass Pyramide du Louvre (Louvre Pyramid) is visible from one wing of the shopping center. In addition, the Carrousel du Louvre includes an extensive exhibition space where major annual events like the Paris Photo exhibit are traditionally held. Heading westward from the Louvre, most of the shops situated on Paris' famed Avenue des Champs Elysees are open on Sundays, including Louis Vuitton (at #101), Zara (#44), the high-end convenience store, pharmacy and kiosque, Drugstore Publicis (also #44), fashion concept store Le 66 Champs-Elysees (#66), in addition to the Virgin Megastore, rival book, music and electronics seller Fnac, Quicksilver, Marionnaud, Sephora, Gap, or the Disney Store. As can be expected, crowds tend to be thick on Sundays on the "Champs". I recommend getting yourself to the area in the early morning to avoid feeling like you're shuffling through an anthill. Make sure to check store times, however: many don't open before 9:30 or 10:00 am. The La Défense Quatre Temps shopping center is a sprawling complex just outside the Paris city limits within the ultra-metropolitan business complex known as La Defense. It houses 230 shops, 30 restaurants, a giant multiplex cinema showing many English-language films. Open: Most shops are open from 11:00 am to 7:00 pm on Sunday. In the upscale, trendy Marais neighborhood, many of the area's most-coveted fashion, accessories and home design boutiques remain open on Sunday. As such, a weekend stroll in the district following brunch has become habitual among fashion-conscious Parisians. 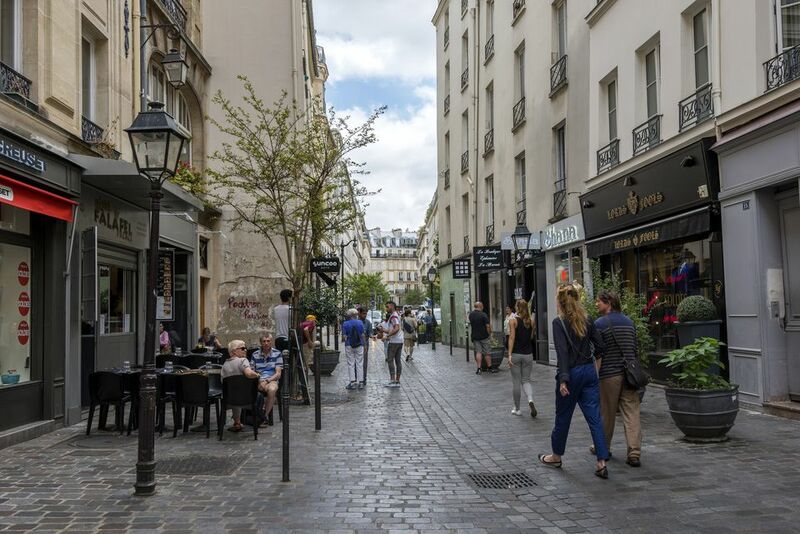 The Rue des Francs Bourgeois (access: Metro Rambuteau or St Paul)is brimming with open shops, such as MAC, L'Artisan Parfumeur, Zadig et Voltaire, French chain Comptoir des Cotonniers, or artisan jewelry sellers and young designers' boutiques. Take a spin of the stores and then have a peek at the collections on Paris history at the Musee Carnavalet on the same street. For home design in the Marais, head to Le Printemps du Design inside the Centre Georges Pompidou (Metro Rambuteau), or to Marais boutiques like DOM (21 rue Sainte Croix de la Bretonnerie, Metro St Paul or Hotel de Ville) for amusing decorative objects (admittedly bordering on kitchy). Not only is the Marais great for fashion addicts, antique collectors and anyone looking for original accessories: it's also fantastic for street food, gourmet teas and chocolates, gelato and more. See our guide to the best street food in Paris for suggestions on where to head. Also see this piece on the best spots for afternoon tea in the capital. It may be little-known to visitors from out of town, but it can be a fantastic place to spend a Sunday. This shopping center, a new addition to Paris' relatively quiet 12th arrondissement, is situated just across from the Bercy Park and in close reach of the up-and-coming National Library (Bibliotheque Nationale) district. Shops open here on Sunday include designer Agnès B, home and garden store Truffaut, Nature & Découvertes, Sephora, Résonances or Andaska. There's also a large number of restaurants and a multiplex cinema offering many films in English. In the hilly heights of the iconic Montmartre district, several concept boutiques remain open on the Rue d'Orsel (Metro Pigalle or Abbesses), which has in recent years become a new center of style, especially for those interested in local and up-and-coming designers. Base One (at 47 Rue d'Orsel) is a concept shop offering men's and women's fashions from France and Europe. Gaspard de la Butte (at #57) is a boutique owned by French designer Catherine Malaure. Nearby, at 16 rue la Vieuville, you'll find another concept store open on Sundays, Spree, offering clothing, jewelry and home furnishings, both new and vintage. Need to stock up on gourmet items this weekend? Most supermarkets are closed on Sunday, but you can still hit some of the world's best bakeries, patisseries, and dozens of open-air food markets in Paris, like the Marché d'Aligre pictured above, open all Sunday morning. Chinese, Tunisian, Mauritian and general grocers in Belleville and the Gobelins neighborhood also mostly stay open. In Belleville, head to Boulevard de Belleville, Rue de Belleville, or Boulevard de Belleville (Metro Belleville) to stock up on Chinese, Middle Eastern or East Asian food items. In the south of Paris, head to Tang Frères Chinese supermarket (48 Avenue d'Ivry, Metro Porte d'Ivry) or one of the numerous other Chinese grocers in the vicinity. If you need to procure medication, specialty beauty products, or other items from pharmacies, you're in luck: a few remain open on Sundays. See our article on Paris pharmacies open late or 24/7 for a list of these.